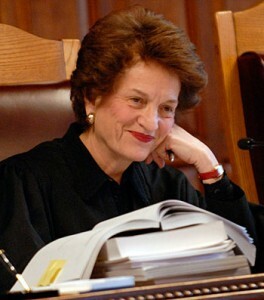 Judith S. Kaye, former Chief Judge of New York, passed away on Thursday. She was the first woman to serve as a member of the Court of Appeals, the state's highest court, and the first woman and longest serving Chief Judge in the Court's history. But she was much, much more than that. It is customary for lawyers to praise judges effusively on occasions recognizing their achievements or even simply for their being judges. And it is customary, of course, to speak exaggeratedly well about the deceased on the occasion of their passing. But for Chief Judge Kaye, the most effusive praise is more than deserved, and it would be difficult to exaggerate all that she was, all that she represented, and all that she meant to those who knew her, worked with her, or otherwise met and admired her. To get a sense of this judge, this woman, this magnificent person we just lost, consider these heartfelt, honest, accurate reflections by individuals who did know her and work with her. They are excerpted from tributes to Chief Judge Kaye that were part of a dedication to her several years ago in the Albany Law Review. Judge Kaye is more than a role model and trailblazer, more than a first-rate jurist and champion of justice and women’s rights. Judge Kaye’s graciousness, generosity, and fierce determination make her an icon—a true superhero—who in her black robe and red shoes will continue to be our Chief, for now and for always. Judge Kaye's decisions demonstrate an ever-present awareness that cases involve human beings and that the role of the courts is to balance a respect for abstract principles with an appreciation for the fact that in the real world, there is no such thing as an abstract principle since the application of a rule or precedent in any particular situation necessarily has an impact on peoples' lives. Through her leadership and decision-making, current and future generations of New Yorkers will have the benefit of Judge Kaye's wisdom. By her words and her deeds, she reminds us daily that underlying all situations, regardless of their factual or legal complexity, there are real live people, with their own unique individuality and common humanity. What can you say about the longest serving chief judge in the history of the Court of Appeals that has not already been said? What superlative can you use...that does not seem inadequate or trite? How can you possibly pay tribute to one of the great jurists of our time in a few short pages? The answers to all these questions are obvious. You cannot do justice to the Chief Judge through mere words. To be sure, pundits will read and analyze her many judicial opinions, scholarly writings and speeches, assessing her career as a jurist. But perhaps most significantly, generations of lawyers will continue to look to her as a role model, the archetype of what can be made of a life in the law, and a stunning example of how a single individual from modest beginnings can, with perseverance and determination, realize her full potential and achieve greatness and immortality. Chief Judge Kaye is...one of the most recognizable and respected--nay, admired--judicial figures in America...She is a beloved inspiration to women--and men as well--whether aspiring members of the legal and judicial professions, accomplished and proud members of those professions, consumers of legal and judicial services, or the general public who look for the best in our courts and judges as the ultimate guardians of our cherished freedoms, equal justice, and the rule of law. Indeed, she is widely viewed as the best. To those who know Chief Judge Kaye, who have worked with her, who have been close to her professionally or personally, she is the best. She is the best there is in government. There is no more decent and devoted and ethical and capable and conscientious and selflessly committed official in public life. She is the ideal of a public servant. And on a personal level, she is warm, generous, appreciative, kind, empathetic, compassionate, caring, indeed loving, and well-loved. It is no wonder, then, that Judith S. Kaye, whether as New York's Chief Judge, as a colleague of judges, lawyers and scholars, or as a friend, is cherished as a professional and personal treasure. In Part 2, we'll consider some of the hallmarks of Chief Judge Kaye's jurisprudence as reflected in her own words in judicial opinions.